Deckhand Patrick Gallager tosses the day's catch to the dock from the Fairwater Two charter boat. The charter boat Fairwater Two pulls into its slip at Zeke's Marina. "Everybody can get off the boat except the guy with the money," jokes Captain Tom Ard after he docks the boat. He's back from a day-trip chartered by a Tennessee businessman taking his clients on a fishing trip. They've caught nearly two dozen nice sized red snappers. Recreational fishermen say red snapper are abundant in the Gulf of Mexico and question the stock assessments behind strict government quotas on the catch. Now, the boat docks at Sportsman Marina in Orange Beach, Ala., are laden with the catch. "We got six snappers and we got a bunch of vermilions," says Keith Green of Atlanta as he unloads a cart full of gleaming red fish at a stainless-steel cleaning table. His fishing buddy, Tony Reaves, is working a sharp knife through the flesh of a 12-pounder. "Just cut right along the top of the spine there," he explains, carving out a nice fillet. 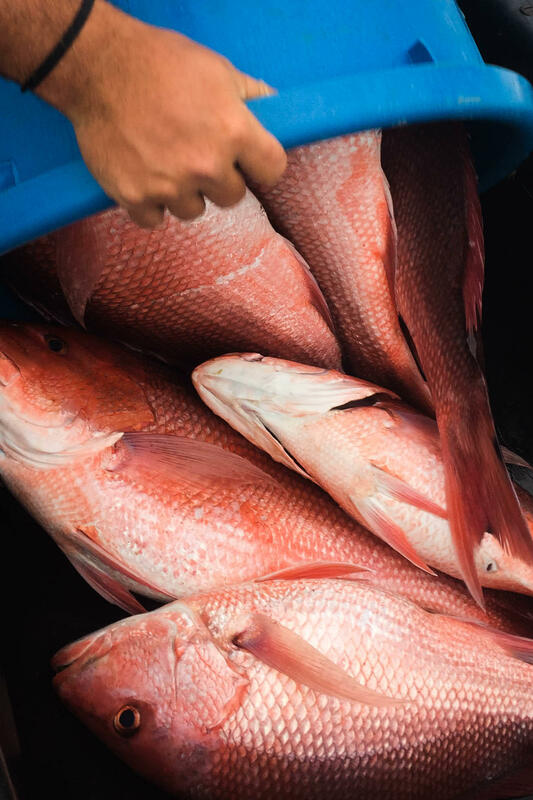 They're taking advantage of the new, extended recreational red snapper season in the Gulf of Mexico – now open every weekend and holidays through Labor Day, rather than only three days in June, as it was originally set. "They crossed the line when they went to a three-day season," Reaves says. "That's what finally set everyone over the edge to finally say, enough's enough." "I mean, it's just ridiculous," says Green. "I'm glad to see 'em changing it." Reeves and Green say red snapper are abundant. That wasn't the case 20 or 30 years ago. The fishery was nearly wiped out, so the federal government has closely regulated the catch ever since. 1. Private anglers like Reaves and Green, who have their own boats. 2. 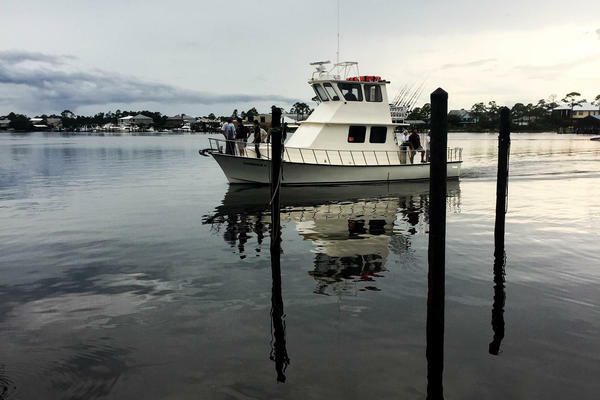 The for-hire sector — charter boat captains who charge money to take people out in the Gulf to fish. 3. Commercial fisherman – the boats that catch the red snapper you find on the menu at a seafood restaurant. In recent years, that system had resulted in contentious litigation and fewer and fewer days open to the recreational group. "We want a fair shake," says Blakeley Ellis, executive director of the Coastal Conservation Association of Alabama, a group representing private anglers. "If we can't go, I don't think it's fair that I've got to sit on the dock and somebody can write a check and get to do the same thing," he says. He's pleased with the 39-day season but calls it a short-term fix. The five Gulf states agreed to limit the red snapper season in state waters – roughly 9 miles off shore — in exchange for the extra days in federal waters further out. The agreement came after Sen. Richard Shelby, an Alabama Republican, grilled Commerce Secretary Wilbur Ross about snapper management during an appropriations hearing last month. "How will the department's new leadership team, which you head, ensure that NOAA looks for ways to help recreational fisherman gain greater access to the abundant red snapper fisheries, rather than finding ways to restrict them?" he asked. "We've got a problem there, Mr. Secretary," said Shelby. "I share the president's commitment to cutting unnecessary red tape and eliminating failed regulation," Ross replied. Congress members from across the Gulf Coast ramped up pressure on the Trump administration to ease restrictions on the recreational catch. "Show me where in the Constitution it gives the federal government the power to tell us we can't fish," says Republican Rep. Bradley Byrne, who represents coastal Alabama. Watching boats from the dock at Sportman Marina, Byrne says the issue's been mounting for years. "It was just electrifying to people all up and down the Gulf Coast," he says. "We go out there fishing for other fish and all we can catch is snapper, because they're everywhere." Byrne has proposed legislation to turn snapper management over to the states. And that's what local officials want. "It only makes fair sense for the state to manage what we've created," says Jeff Boyd, a councilman with the city of Orange Beach, Ala. "We have created the absolute best red snapper reef system in the world." There are more than 10,000 underwater structures that public and private interests have put in the Gulf off Alabama's coast to attract bottom feeders like red snapper. 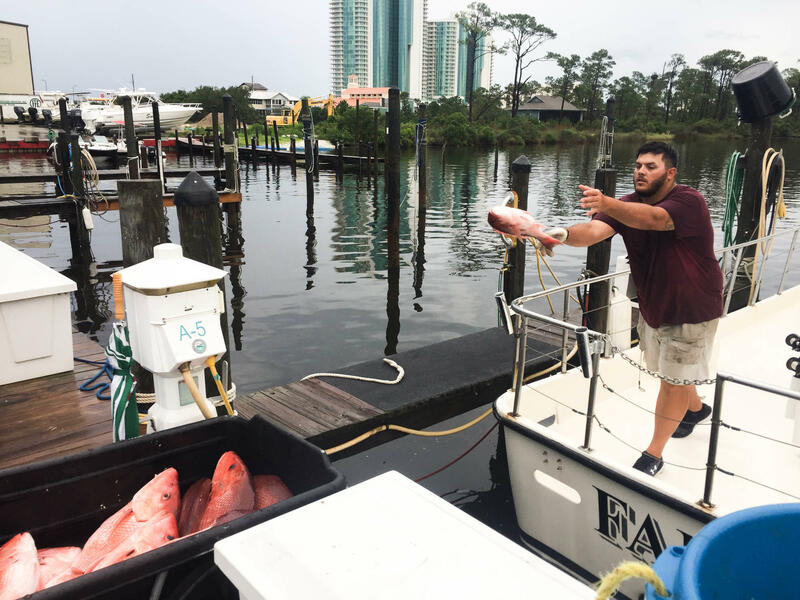 The fishery has become an economic engine for Orange Beach, which bills itself as the Red Snapper Capital of the World. But not everyone here is happy with the new arrangement. The charter boat Fairwater Two pulls into its slip at Zeke's Marina. "Everybody can get off the boat except the guy with the money," jokes Captain Tom Ard after he docks the boat. He's back from a day-trip chartered by a Tennessee businessman taking his clients on a fishing trip. They've caught nearly two dozen nice-sized red snapper. Ard's family has run charter boats for 37 years. He's upset that the Commerce Secretary overruled regulators. "This decision was not based on science," Ard says. "It was based on politics." Ard is on the board of the national Charter Fisherman's Association, which has sent a letter to the Commerce Department calling it a dangerous precedent that could lead to overfishing, and stricter quotas for everybody next year under federal law. "What's going to happen if too many fish get caught?" Ard asks. "The rules say you're gonna pay them back." Ard agrees that stock assessments don't reflect how well red snapper have recovered. But he also remembers when the stock was nearly decimated and says you can't just do away with oversight. "If you're for regulation, you're a damn liberal. I've heard that so many times it's not funny," he says. "I do this for a living, alright? This is my livelihood." Ard says he wants the fishery in the Gulf of Mexico to be as strong as possible. And that's what recreational fishermen say, too. "We do have to have conservation, but it has to be sensible conservation," says Drew Rambo, who has come to the Sportsman Marina to provision his family's boat, named the Salty Dog, for a weekend snapper fishing trip. He was pushing for a longer federal season but admits he's a little worried about how it will play out. "I hope it doesn't cost us in the future," he says. "I hope it doesn't cost us having no snapper season next year." There's a fight going on about who can fish for red snapper in the Gulf of Mexico and for how long. Here's the backstory. The National Oceanic and Atmospheric Administration set the shortest recreational snapper season ever. People got mad and asked the Trump administration to intervene. The result was a deal between the Commerce Department and Gulf states to extend the season. But people who make their living on fishing snapper say it could cost everyone in the long run. NPR's Debbie Elliott reports. DEBBIE ELLIOTT, BYLINE: At Sportsman Marina in Orange Beach, Ala., the boat docks are laden with the day's catch. KEITH GREEN: We got six snappers, and we got a bunch of vermilions. ELLIOTT: Keith Green of Atlanta unloads a cart of a gleaming red fish at the stainless steel cleaning table. His fishing buddy Tony Reaves works a sharp knife through the flesh of a 12-pounder to carve out a fillet. TONY REAVES: Cut right along the top of the spine there. ELLIOTT: They're taking advantage of the extended recreational red snapper season in the Gulf of Mexico now open every weekend and holidays through Labor Day - much better than the initial three days in June set by the federal government, they say. REAVES: They crossed a line when they went to a three-day season. GREEN: I mean it's just ridiculous of them. So I'm glad to see them changing it. ELLIOTT: They say red snapper are abundant. That wasn't the case 20 or 30 years ago. The fishery was nearly wiped out, so the government has closely regulated the catch with a quota system that splits the resource between the three different groups that want red snapper - private anglers like Reaves and Green who have their own boats, the for-hire sector, charter boat captains who take people out on the Gulf to fish and then commercial fishermen, the boats that catch the red snapper you find on the menu at a seafood restaurant. In recent years, that system has resulted in contentious litigation and fewer and fewer days open to recreational fishers. BLAKELY ELLIS: We want a fair shake. ELLIOTT: Blakely Ellis is director of the Coastal Conservation Association of Alabama, a group representing private anglers. ELLIS: If we can't go, I don't think it's fair that I've got to sit on the dock and somebody can write a check and get to go do the same thing. ELLIOTT: He's pleased with the 39-day season but calls it a short-term fix. The five Gulf states agreed to limit the open snapper days in state waters roughly nine miles offshore in exchange for the extra days in federal waters further out. Congress members pressured the Trump administration for the deal. Republican Representative Bradley Byrne represents coastal Alabama. BRADLEY BYRNE: Show me where in the Constitution it gives the federal government the power to tell us we can't fish. ELLIOTT: Watching boats from the dock at Sportsman Marina, Byrne says the issue has been mounting for years. BYRNE: It was just electrifying to people all up and down the Gulf Coast because people just had it. They just said, you know, it's ridiculous. We go out there fishing for other fish, and all we can catch is snapper because they're everywhere. JEFF BOYD: So it only makes fair sense for the state to manage what we've created because we have created the absolute best red snapper reef system in the world. ELLIOTT: There are more than 10,000 underwater structures that public and private interests have put in the Gulf off Alabama's coast to attract bottom feeders like red snapper. The fishery has become an economic engine for Orange Beach, which bills itself as the red snapper capital of the world. But not everyone here is happy with the new arrangement. The charter boat Fairwater Two is pulling into its slip at Zeke's Marina after a day trip. TOM ARD: Thanks, guys. Patrick has it from here. ELLIOTT: Captain Tom Ard's family has run charter boats for 37 years. He's upset that the commerce secretary overruled regulators. ARD: This decision was not based on science. It was based on politics. ELLIOTT: Ard is on the board of the national Charter Fishermen's Association, which calls the action a dangerous precedent that could lead to overfishing and stricter quotas for everybody next year under federal law. Ard agrees that stock assessments don't reflect how well red snapper have recovered, but he remembers when the stock was nearly decimated and says you can't just do away with oversight. ARD: If you're for regulation, you're a damn liberal. I've heard that so many times. It's not funny. I do this for a living, all right? This is my livelihood. I want that fishery in the Gulf of Mexico as strong is I can make it. ELLIOTT: His boat brought in about two dozen big red snapper to the dock this trip. The question is, will he be making those trips next year? Debbie Elliott, NPR News, Orange Beach, Ala.
(SOUNDBITE OF ZANE JASON JOHNS SONG, "WE DON'T TALK ANYMORE") Transcript provided by NPR, Copyright NPR.